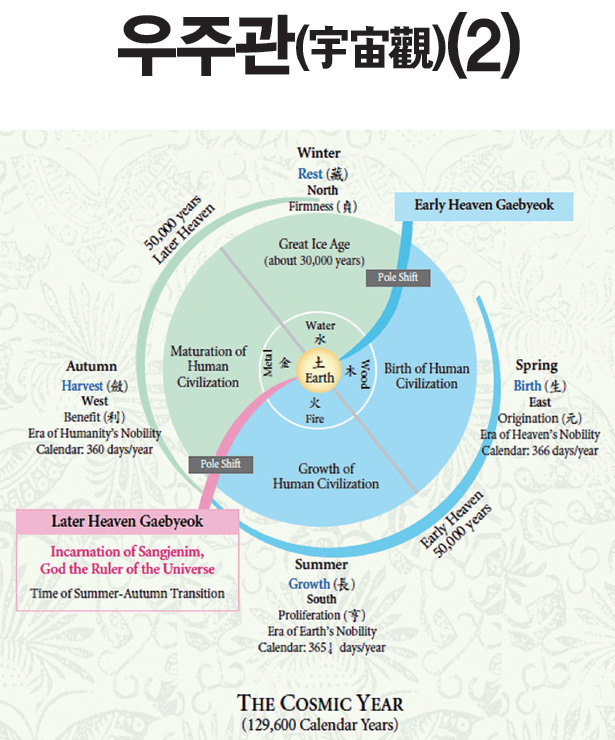 cycle of the four seasons. lie within change (역 易). Brandon: You told me that the purpose of the cosmic year is to cultivate humanity. What does that mean? I: A cycle of cosmic year is the process through which the universe gives birth to human beings and nurtures them. Brandon: Can you explain that in details? I: OK. So you remember that I told you about the principle of birth, growth, harvest and rest, right? That principle applies to the four cosmic seasons in the same way. Cosmic spring is the time when humanity comes forth on earth and cosmic summer is the era when our humanity’s civilization develops. Brandon: Then what comes next is the cosmic autumn and it’s time for our civilization to bear fruit, right? ’Cause autumn is the time for everything to bear fruits. I: It sure is, Brandon. And the cosmic winter is the Great Ice Age. For thirty-thousand years, all life on earth goes into hibernation. Now, let me ask you one question. Which season do you think we’re now living in, among the four cosmic seasons? Brandon: Isn’t it the cosmic autumn? I: Cosmic autumn? Why do you think so? Brandon: Because, our civilization is extremely advanced now. Our average life expectancy increased and we’re eradicating diseases. So this has to be the world of cosmic autumn, right? I: When it comes to material civilization, our humanity made astonishing progress. But seeing the other side, there are still problems causing pain to people, such as wars, violence, and discrimination. Brandon: Hmm. You do have a point. The world has made such progress, yet we haven’t matured, right? Then are we still in the time of cosmic summer? I: Yup! We’re living in the cosmic summer. More precisely, we’re living in the transition between cosmic summer and cosmic autumn. Brandon: Then it means that the cosmic autumn is arriving soon! I can’t wait to see the entire world living in peace and harmony. 1. The purpose of A is to V(동사) ~. 2. Which N(명사) do you think we ~? 어떤 N을 우리가 ~한다고 생각해요? 4. I can't wait to V(동사) ~. 1. The purpose of the cosmic year is to cultivate humanity. 우주 년의 목적은 인간 농사입니다. The true purpose of our life is to be awakened to Sangjenim's teachings and become Tae-il. 우리 삶의 진정한 목적은 상제님의 진리를 깨달아 태일(太一)이 되는 것입니다. The ultimate purpose of Jeung San Do is to lead all humanity to the Paradise of Immortality in the Later Heaven. 온 인류를 후천 선경으로 인도하는 것이 증산도의 궁극적인 목적입니다. 2. Which season do you think we are now living in, among the four cosmic seasons? 우리는 지금 우주 사계절 중에 어느 계절에 살고 있을 것 같아? Which books do you think we should read in our lifetime? 넌 우리가 인생에서 어떤 책들을 꼭 읽어야 한다고 생각해? Which attractions do you think we should visit in Seoul? 서울에 오면 어떤 관광지를 가 봐야 한다고 생각하세요? [Dig Deeper!] 문장 중간에 들어간 ‘do you think’는 ‘당신이 생각하기에’ 정도의 뜻으로 보시면 됩니다. 세 번째 문장을 예로 들자면, 원래는 Which attractions should we visit in Seoul? (서울에 오면 어떤 관광지를 가 봐야 할까요?) 정도의 문장이었는데 여기에 ‘당신 생각은 어떤지’를 묻는 삽입구가 들어간 것입니다. 이렇게 ‘do you think’를 중간에 넣어 말하는 경우, 문장의 동사와 주어가 도치되어 should we~가 아니고 we should~가 됩니다. 3. When it comes to material civilization, our humanity made astonishing progress. 물질문명에 관해서라면 인류는 정말 놀랄 만한 발전을 이뤘지. When it comes to learning the cosmology, you can ask Charlie for help. 우주관 공부에 관해서라면 Charlie에게 도움을 부탁하면 될 거야. When it comes to the ancient history of Korea, you shouldn't miss out Hwandangogi. 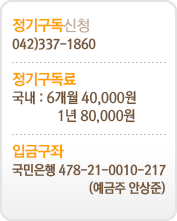 한국의 고대사에 관해서라면 『환단고기』를 빠뜨리면 안 돼. 4. I can’t wait to see the entire world living in peace and harmony. 빨리 좋은 세상이 와서 사람들이 다 평화롭게 살았으면 좋겠다. I can’t wait to see you coming to the dojang and practicing meditation with us. 어서 당신이 도장에 와서 우리랑 같이 수행하시면 좋겠어요. I can’t wait to join the intensive meditation starting next week! 어서 빨리 다음 주 집중 수행에 참여하고 싶어! 3. In the Later Heaven, all people will live in _________________ with each other. 5. In the Early Heaven, the _________________ civilization extremely developed. 1. _________________ is the season between summer and winter when the trees bear fruits. 2. Your _________________ is the thing that you want to achieve. 3. During the cold winter, some animals get into _________________.